Purchased batteries from Outfitters for about 20 yrs ( trolling and starting). Had problem with one battery, would maintain voltage but low amps. Replaced without a problem. https://www.ozarkswaterwatch.org/wp-content/uploads/2016/02/MDC-Report-on-TABLE-ROCK-LAKE-2014.pdf Keep beating this drum, but if you look at item 7 of this report "Conduct at least one public meeting to discuss fisheries management at Tablerock". That is the meeting I'm trying to find. Don't know , so can anyone tell me if MDC has had a public meeting regarding the state of any fisherie in the state. First I think most available information indicates that Tablerock as a fisherie is on a negative trend. 20 yrs ago when you set the hook you had that feeling that you could hook a 5 lb fish or bigger. Nowadays ( as most posts on this forum indicate) you brag about how many keeper fish you caught in a day. Even our little tourney hasn't squeeked out a 5# fish; tournament bag weights are smaller; COE survey in 2010 ( newest I could find) of a million plus people coming to Tablerock, of which 20% came for fishing, indicated that fishermen were more negative than positive about fishing trends. Second, what kind of fisherie do you want Tablerock to be? A lot of smaller fish; bigger fish at the expense of numbers: largemout, smallies, kentuckies. I would assume that stocking, forage and regulations would have an effect. I'm no expert ( obviously) but stocking forage ( a few ton of crawdads) rather than fish. Lastly, I agree with bo about communication but I think communication with the Conservation commision is the way to go. MDC is funded thru a 1/8 cent tax thru a Missouri constitution amendment. The Conservation commission controls the allocation of funds and regulation. Their mandate ( see the Commission website) says they will talk to the public and manage harvestable fish and wildlife at biological and socially acceptable levels. Seems to me that we have at least a social argument. Again back to the money. I think there are about 10 fisheries operated by MDC. Of those fisheries the majority are trout fisheries as trout have to be stocked to keep up with fishing pressure. In addition, most missouri streams do not support a native population. I think a few MDC fisheries raise channel cat, etc. but no bass fisheries. that I know. So where do you get the fish? I can see why MDC doesn't give missouri lakes a high priority. Financial impact info is available for trout fishing but little info on the financial impact of lake fishing. Anybody in their right mind goes with the money ( tags, etc) that directly effects their income or budget. Bo, I agree with your idea of informing MDC. Small drops of water eventually will break a rock. In greater number and at a more frequent rate the rock breaks faster. BUT, I think an economic approach needs to be addressed. MDC touts the economic impact of trout fishing but you find little information about the economic impact of other fishing. If we can find a dollar impact, then we have a stronger argument for change. I would like to see if anyone on this forum can find a $ number . Not catching gives you an excuse to go out and practice some more until you get it right !!! I'll take your bid. Sittin at Ball and Prior, when you gonna get here ? Black/white 5" screen, depth and water temp. Transducer, cable and mount. Good condition about 4yrs old. Best offer or trade. Pick-up or delivery only from Golden area. On the water between 5am and 8. 20+ fish with eight keepers ( 15/17 on golden rule). Swim jig with paddle tail trailer. Setting in 40ft, catching in the 20-25 ft range. Gravel to shelf rock sloping. Tried to keep jig about 12 inches off bottom with a swim/stop pattern. Only thing of interest was no takers on arky with a craw trailer and best bite was on swim jig with rubber skirt vs. silicone. Count me in. Anybody in for an early morning doughnut? If not let me know. Wet my first line in table rock in mid 1960's and can agree that fishing has been downhill since. 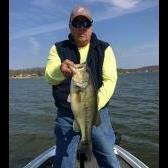 Maybe aging lake or other factors or deteriorating fishing ability. But every year I look at my historical record and set goals for the next year. At the end of the year I compare my performance against my goals and last years performance. This comparison looks at improvemen perrformance ( comparisn of year to year) and year against my goals. My point is year to year data only gives operational information when compared to a goal. Year to year indicates if you are moving in the desired direction. Maybe the question should be about the goals of fish population. I am sure that MDC can provide info about goals of trout pounds.